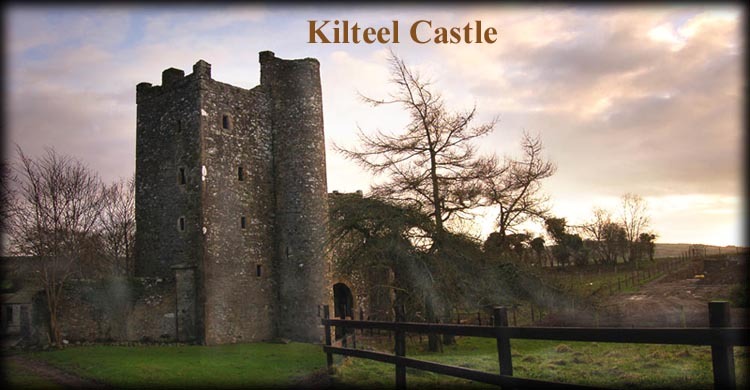 The castle at Kilteel was built on the site of an earlier monastic settlement, see Kilteel Church. A preceptory of the Knights Hospitallers of St John of Jerusalem was founded here in the early 13th century by Maurice FitzGerald and part of the original wall of the preceptory still stands today. 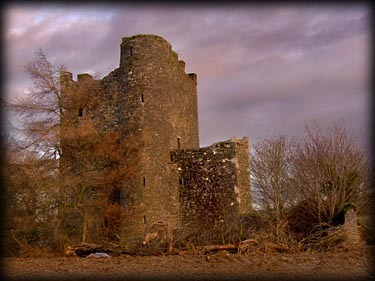 The main Castle that we now see is a fifteenth century five storey tower house with a gatehouse and projecting tower with a spiral staircase. The castle is now a designated National Monument. Situated: From Dublin take the N7 and then the Kilteel exit, after 2K keep right at the fork then right at the crossroads. The castle is 100 metres beyond the next left turn. Discovery Map 50: N 9831 2126. Last visit Feb 2009.